Top quality construction. Square Eye Trigger snap. Sold in packages of 6. The quality was much more than I expected. With the 30% off it really made my day. These snaps/clips were great items that left me happy with my purchase. The metal is in tip top perfect shape! I am excited to use these clips, and I expect them to fill all my expectations. Perfect, exactly what i wanted. THANK YOU! Great price also! For crying out loud! Its a piece of hardware! What do you want e to say about it?Geese! Just as expected and always good to have on hand as I can't find them locally. Just what I wanted and expected. I've revamped all my reins & crupper snaps. Brass and able to buy bulk with better pricing. great deal. Everyone needs a bag of these in the tack room or trailer. Easy quick fix to broken tack, tie a twine string to one and hook to a bucket or hay net to, a million uses. Exceptional price for the 6-pack of trigger snaps. Great for split reins and belt bags. Much less expensive than the retail stores for the very same product. I'll be buying again. Clip on belt bag. Great for horseback and motorcycle riding. The clips appear to be of good quality. The internal opening of the loop is a full 1 inch. Surprise! I could have ordered a 3/4 inch snap for my reigns. Works well for my needs. Last a long time. Of course, how long depends on what you are using them for. So far so good!! makes tacking sooo much easier! Work very good for what we needed. Thank you! Great clips!! Use them on the farm for quickly disconnecting the reins after a trail ride comes in. Good Snap. Using on breast collar connection to cinch. Also use themfor quickly releasing reins from bits. I bought these to replace some heavy brass snaps on my bridle, and like to keep spares around just incase you need one. We will see how well they hold up, but the are in a location where they should be just fine. I made a mistake on my last review, I stated I was shorted a couple of snaps in my order. Mea Culpa, I was wrong, I had forgotten how many I had ordered. My apologies. As a cavalry reenactor, I appreciate the look of brass. While not being period, it goes with the rest of my fittings. Love these for quick change out on reins. These are nice and compact not long in length like the others I looked at. Also like the square eye because the rein ends fold over flat and not on a curve. Bought these in the 1" to make switching out my reins easy. Works best with my western split reins as they don't have that little extra piece of thin leather by the stud hook as the english reins do. The english leather is a definitely thicker, which made it tight to pull through a doesn't allow for any swivel. Does the job but wish there was just a smidge more room. I was happy with the product and happy with speed of shipping.. These snaps are great for multi-purposes, such as reins and wither straps. They are strong and durable. We order over 100 and received a great discount. The speed of delivery and quality of the square eyed trigger snaps were both great! these come in handy for many tack repairs. very good quality. These snaps make changing reins so easy. Light doesn't add weight to the mouth. Haven't had them long enough to see if how durable they are but so far great. Must have around the barn & kennel. I only needed one but it was such a good deal I bought the package of 6. Now I'm going around replacing all the old worn out bolt snaps on all my tack and leashes. Used these when I made a pair of reins. They have held up very well so far. They are very handy and the shipping and price was great. Excellent product, excellent price. I've used them multiple times. It's hard to find this size scissor snaps in stores. Really glad Stateline Tack sells these! They seem like nice quality too -- I guess only time will tell. To hook on the end of my reins and on my breast collar, where it hooks to the saddle. I like to be able to move reins from one bridle to another easily. I use these on all my reins. M mom rides and she prefers split reins, I like trail reins, my daughter like a colorful set. Now we all get what we want quickly. 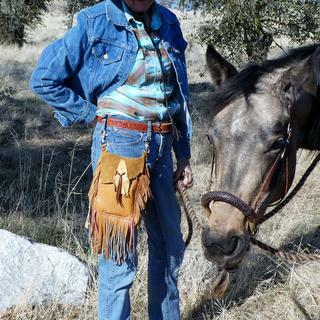 I am making a purse from a pair of boots for a horse rescue benefit auction. These snaps are for the purse handles. This attachment is a very convenient way to keep reins that will be detatched often. These are great quality and you can't beat SLT price. We like the look of these trigger snaps and so do most of our customers. They are good quality and well worth the money. Easier way to put my barrel reins onto my bit. Really dresses up the old reins to replace these. Planning to attach an English breastplate to the d-rings with these instead of having to unbuckle each time. Makes switching reins so much easier and quicker. I have them on all of my reins. use these all the time, but not on reins. These were the best price for snaps I need to make "rainbow" reins for therapeutic riding. Exactly what I needed for paracord horse tack. Great to have extras in the trailer. Used a million of them so far, they work great. The sale was good on this product. I like to be able to switch my reins as I please and this makes it easy. I have a few breast collars, and wanted something to make it an easy switch between them. Needed to do some repair of equipment. These are very good quality. I have ordered over 200 and they are consistently good quality. I love the convenience of switching out reins and these snaps work! Good to have on hand - just in case..
What size is recommended for reins? BEST ANSWER: It really depends on what size your reins are. My leather reins are 3/4 wide so I bought the 3/4 snaps and they fit perfect in the square part of the snap The size is based off of the square part I believe not the snap ring part. The size of the trigger snap will equal the width of the strap or rein to which it will be assembled. Therefore, a 3/4" snap would be proper size for a 3/4" wide strap. Reins are typically be 5/8" wide. The size you need will depend on how wide your reins are. The square eye will accommodate a 3/4-inch rein. Have not used these snaps for reins. Used them as end pieces for cross ties. The 3/4 inch snap will fit most reins. Whatever your reins will fit through. BEST ANSWER: Yes, the snap swivels around the base. Yes. Very nice piece of hardware! So when you order 1 quanity you get 6 of them correct? I felt these were a good deal and they have stood up to use fine. Hope this helps. Yes. The package has 6 separate clips in it. Ours work great. We purchased them for horse blanket latch replacements. Correct, these are a pack of 6, so if you order quantity of 1, you will receive 6. Yes, it does come in a pack of 6. Correct. 1 pack of 6 each. Can I use these clips to connect the bottom of my one ear bridle to the bit? BEST ANSWER: yes..with one thing to consider. a snap, as handy as they are would put more weight at the bit. With that in mind though, getting the smallest snap that matches the width of your bridles cheek strap would help. It definitely makes it easy to change out bits! Yes you should be able to, but make sure it doesn't rub your horse's cheek. I would not recommend these clips for that purpose. It would not be safe. Thatâ€™s what we used them for on several bridles. BEST ANSWER: I've had mine for about 2 years now on some leather reins. They have yet to rust or needed to be replaced. They're nice snaps! No rust so far after 2 years with use on lead lines, bridles. Not outdoor 24/7. Very happy. No, I don't see how they can rust. They are nickel. I've never had one rust. BEST ANSWER: These are not stainless. They are available in a choice of brass- or nickel-plated. Not sure. Think so. Haven't rusted. Great for many uses. They come in Brass and Nickel. what would be the ideal size size to use for reins? BEST ANSWER: It depends upon how wide your reins are. Usually, the 3/4 inch works. The inside diameter is a full 3/4 or 1 inch. We have always used the 1 inch nickel for our reins and they work well. Hope this helps with your decision. I believe the one inch would work great unless you are using extra wide rope reins. a SIX PACK OF 1" NICKEL SNAPS IS $4.19 OR $4.19 FOR EACH SNAP? BEST ANSWER: Sold in packages of 6. Which is better for riding in the ocean brass or nickel?